On Sunday, October 7th, we have a lecture and exhibition on the Design of Dissent in Timisoara, Romania. This DoD show is hosted by TypoPassage Timisoara Micro-museum as part of the MAD(E) IN ROMANIA festival. Organized by Ovidiu Hrin, TypoPassage Timisoara "is an open-air micro museum, dedicated to graphic design and the art of shaping letters." TypoPassage Timisoara will also feature a Tolerance show. We're incredibly grateful for Ovidiu's dedication in organizing both of these shows. This new DoD show is based on the expanded edition. You can see pages from the book on Amazon. For the first set of traveling shows, and now for this new show, we got lots of original art from the participating artists featured in the book. In order to make them more accessible to students and scholars, these works have been donated to the Milton Glaser Design Study Center and Archives at the School of Visual Arts, categorized under the Design of Dissent Collection. 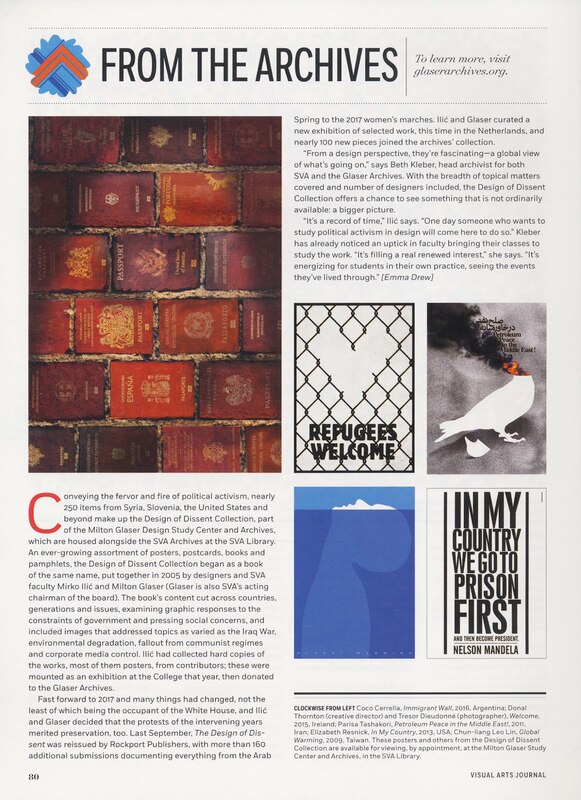 Enclosed here is a page from the SVA Visual Arts Journal about this collection. Read more about the donations and the archive online here.